Home Uncategorized 5 recipes from Atlanta’s best barbecue spots. You’re welcome. 5 recipes from Atlanta’s best barbecue spots. You’re welcome. 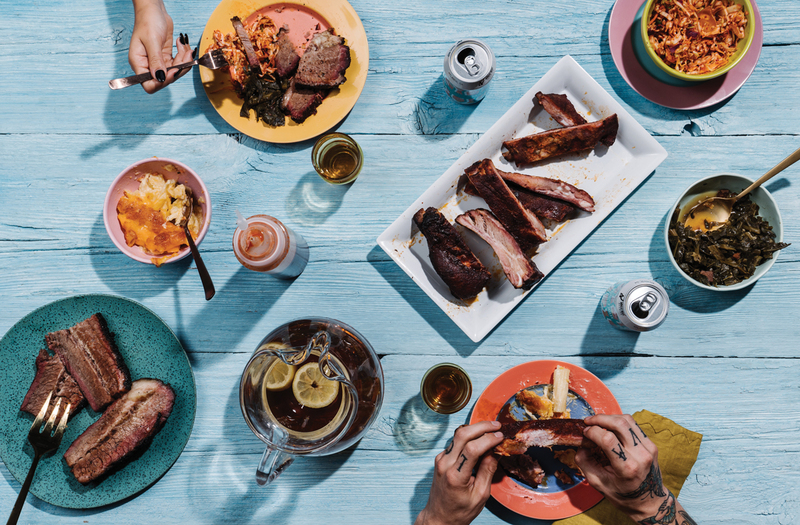 No one in town has approached the art of barbecue with more finesse than the cooks and pitmasters at the 10 restaurants ranked in our September barbecue issue. But that doesn’t mean you shouldn’t try yourself. After all, the origins of Georgia barbecue are rooted in backyards, not in restaurants. The barbecue you make at home could be just as good at what you find at the places on our list. Well, almost. In an effort to create the menu for the backyard cookout of our dreams, we gathered recipes for five of our favorite things to eat—both meats and sides—from three of our favorite barbecue joints. Do you have what it takes to attempt these dishes? There’s one way to find out, and one thing to be sure of: Your friends—at least the ones you invite over—will thank you. All recipes serve eight to 10. Mix thoroughly, and keep in an airtight container. Dissolve both sugars in 3 cups hot water. Add all other ingredients, and mix thoroughly. Add a thin layer of gochujang paste to both sides of ribs, then coat them with the rub; wrap the ribs in plastic, and refrigerate for up to 24 hours. When ready to smoke, reapply rub to any bare spots. Heat a smoker to between 190 and 225 degrees. Add ribs, bone side down, and smoke in that temperature range for five to six hours—or until you can lift them with a set of tongs and they bend into an arc but don’t break. Glaze lightly with Korean BBQ Sauce before serving. In a large bowl, toss cabbage with kimchi sauce, vinegar, and sugar. Transfer to a covered container and refrigerate. May be served immediately or allowed to rest and ferment for up to two weeks. Garnish with green onions and sesame seeds. In the jar of a blender, process garlic and ½ cup water. In a large bowl, mix remaining 1 ¼ cups water with gochugaru, sugar, salt, onion powder, black pepper, and garlic mixture. Whisk until sugar is completely dissolved. Will keep refrigerated for up to two months. Heirloom Market BBQ Recipes courtesy of Jiyeon Lee and Cody Taylor. Saute the onions, country ham, and ⅛ cup garlic in the butter over medium-low heat. Add the collards and stir. Add the chicken stock and water. Bring to a boil, then reduce to a simmer for an hour and a half. Add the sherry vinegar, Red Rooster, and ⅛ cup minced garlic. Simmer for 30 minutes or until greens are tender. Adjust seasoning with salt and pepper as needed. Preheat oven to 350 degrees, and bring a large pot of water to boil over high heat. Season water with salt. Add pasta to water, and cook until just tender, about 12 minutes or according to package instructions. Drain well in a colander without rinsing. Transfer the pasta to a large bowl. Add half the cheddar, Monterey Jack, and Parmesan, reserving the rest for the top. Add heavy cream, and stir to combine. Taste and adjust for seasoning with salt and pepper. Transfer the noodle mixture to a medium buttered gratin dish or casserole. Sprinkle remaining cheddar, Monterey Jack, and Parmesan cheeses on top. Bake until bubbly and golden brown, 30 to 45 minutes. Remove to a rack to cool slightly before serving. Community Q recipes courtesy of Stuart Baesel. Get your smoker to 225 degrees using your preferred heating method. Apply wood chips or chunks to allow for smoke. Mix kosher salt and black pepper together to make seasoning rub. Apply rub to brisket. Place brisket on smoker. Add wood chips as necessary to supply ample smoke through the cook. Once the brisket reaches 170 degrees, wrap in butcher paper, and put back on smoker. Continue cooking until internal temperature reaches 200 degrees. (Total cook time should be about an hour and 15 minutes per pound.) Pull off, leaving wrapped, and let rest for two hours. Unwrap and slice against the grain. Fox Bros. recipe courtesy of Justin and Jonathan Fox. This article appears in our September 2018 issue.